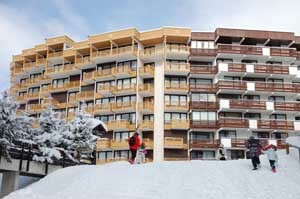 Val Thorens Apartment | Studio Apartment to rent in Val Thorens, Three Valleys. Studio Apartment to rent in Val Thorens, Three Valleys. At the top end of the main part of Val Thorens, you can ski virtually from the doorstep down to the Val Thorens lifts, and then ski back at the end of the day. The apartment has easy access to the huge 3 Valleys domaine. Val Thorens is the highest ski resort in Europe. The accommodation is on the top floor offering majestic south facing views over the pistes. In the quiet Peclet area of Val Thorens, it is conveniently situated for all your skiing needs. Val Thorens is the highest resort in Europe at 2300m, and is part of the 3 Valleys ski area, one of the largest ski “domaines” in the world, with over 600km of marked pistes, ranging from 1300m – 3230m. Our apartment is ideally situated. In reality, the area is actually 4 valleys, with access to the so called fourth valley (Orelle), only accessible from Val Thorens, and is included in the Val Thorens lift pass.